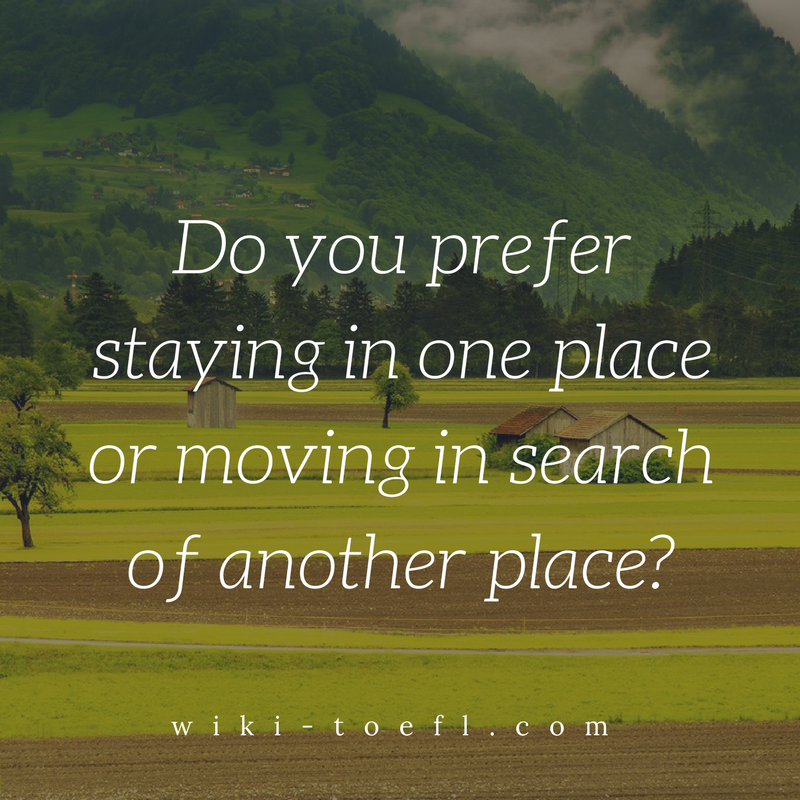 Home Writing	Toefl writing: Do you prefer staying in one place or moving in search of another place? Even though I have lived in the same house, in the same neighborhood, in the same city my entire life. I know I would be happy living in a variety of place. Moving would expose me to new people, new weather, and new housing. Even if I were to move to another part of my city, I would encounter new people. Each neighborhood has a distinct personality. When I move to that neighborhood, I would meet the shopkeepers and residents that shape that personality. I may even adopt part of there manner as my own so I could be recognized as part of that community. If I want to encounter different weather patterns, I would have to move beyond my city. Where I live now, it is the same temperature all year, I would like to go to a place where there are four seasons so I can experience really cold temperatures. I would like to walk in the snow and perhaps go skiing. I could learn winter sports if I lived in the north. Now of course, I live with my parents in their home. It is a one story house built around a courtyard where our family spends a lot of time. If I were to move, I would like to live in an apartment on a very high floor so I could see all around me. I could also meet my neighbors in the elevator and we could get together for coffee in my apartment. The more I move the more I would experience change. I would meet new people in every place I lived; I could move to sample countries with four seasons or even a continent like Antarctica which only has two. Wherever I lived, I would experience living in housing particular to that area. I would then be a citizen of the world, wouldn’t I? Could you call me a foreigner if I called everyplace my home? Toefl writing: Is it better to enjoy your money or to save it for future use?